The Spotlight Retail Group fosters two iconic Australian brands. Spotlight is Australia’s largest fabric, craft, party and home interiors superstore. Anaconda is Australia’s largest outdoor adventure and sports superstore. 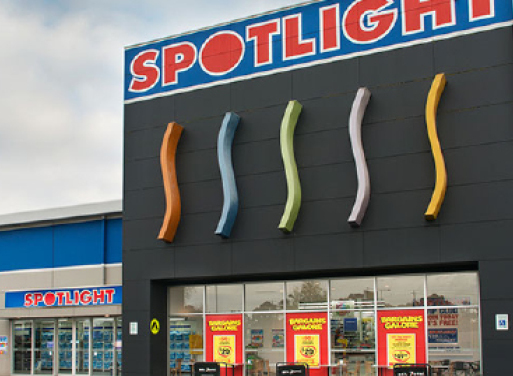 Spotlight Retail Group (SRG) is now Australia’s largest privately-owned and operated family business. Our unique offering of an extensive product range and knowledgeable Team Members in a one-stop shopping destination has cultivated a strong and loyal customer base for both the Spotlight and Anaconda brands. Key to our success has been ensuring customer service continues to be our priority, with every SRG Team Member undergoing extensive training to ensure they have a thorough knowledge of our products, as well as an ability to provide valuable advice. The SRG owns and operates more than 150 stores for Spotlight and Anaconda throughout Australasia. A shared set of values: People, Success and Excellence. The Spotlight Retail Group (SRG) may have become a highly-successful, multinational business, but it still embodies the values its founders absorbed 40 years ago, when working alongside their parents at their family’s fabric stall at Melbourne’s Queen Victoria Market: People, Success and Excellence. The SRG Support Group is responsible for continuing the brothers’ business vision with dedicated buyers, operations, logistics, marketing, customer service, accounting, administration and information technology Teams working together to support our retail outlets. The Support Group presides over an ongoing program of store expansions and renewal, with responsibility for more than 4.2 million square feet of retail space across four countries. The Support Group also invests heavily in our 7,000-plus Team Members, knowing our success story is predominately due to incorporating their passion, skills and knowledge into the day-to-day running of our stores.